Well, the results are in, and New Mexico has once again shined at the Great American Beer Festival. A year after a record eight medals (the best mark before that in a single year had been just four), NM breweries piled up another eight this time around in Denver, including a record five gold medals. That’s not too shabby for one of the least populous states in the country. The winners were announced in a huge ceremony Saturday morning that was streamed live online. And as I originally wrote below about leaving for work before the breweries of the year were announced and all … voila, I pulled a reverse jinx of sorts. Marble Brewery was named the Small Brewing Company of the Year. As in the best in the entire country. Wow. Congratulations to Ted, Josh, Leah, and everyone else! This is a huge achievement for a New Mexico brewery. Long before that, Marble brought home the first medal of the day when they captured gold in the Other Strong Beer category for Double White. It was the sixth all-time GABF medal for Marble and the first gold in brewery history. Marble had previously claimed two silvers for their Pilsner in 2013 and Imperial Red in 2012. Later in the day, Marble earned its second gold for Imperial Red in the Imperial Red Ale category. Way to go, Marble! 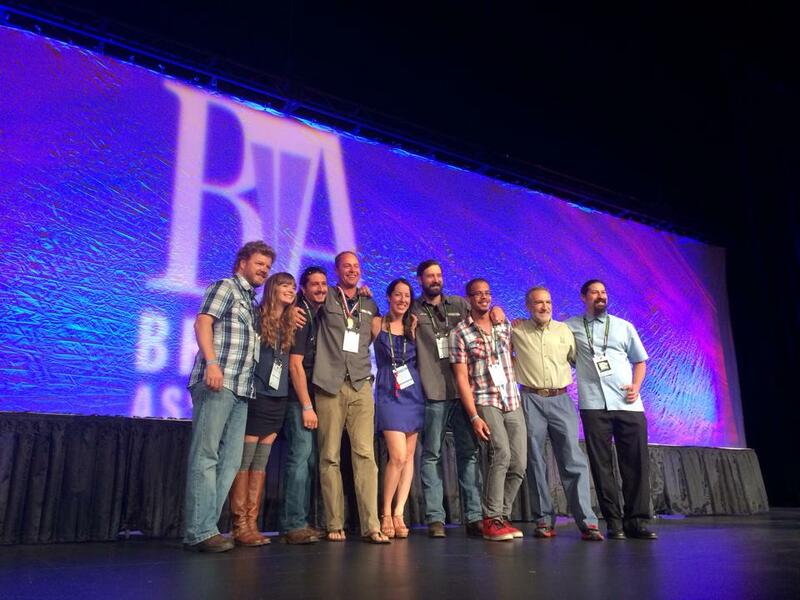 Entering GABF for the first time, Bosque Brewing took home a bronze in the Fresh or Wet Hop Ale category for Acequia Wet Hop IPA. Brewer John Bullard had previously won a pair of silver medals for Blue Corn Brewery in 2013. Santa Fe Brewing brought home their fourth all-time medal with a bronze in the American-Style Sour Ale category for Los Innovadores Kriek. SFBC has three past bronze medals. Canteen Brewhouse (formerly Il Vicino), snagged a silver in the Aged Beer category for St. Bob’s Imperial Stout ’07. It was the 11th all-time medal, with St. Bob’s having previously claimed a silver in Aged Beer back in 2009. It’s the sixth silver in Canteen/Il Vicino’s history. Later in the competition, Canteen earned the second gold in their history (Panama Joe won in Coffee Beer, 2013) when Dougie Style Amber took the American-Style Amber/Red Ale category. Meanwhile, Zach Guilmette claimed his first medal as head brewer when Chama River captured gold in the Bohemian Pilsner category for Class VI Golden Lager. Zach took over at Chama last year and has already made a huge impact. The gold was Chama’s fifth all-time medal and third gold following Three Dog Night (2010, Baltic Porter) and Rye On (Rye Beer, 2004). Blue Corn’s Gold Medal Oatmeal Stout lived up to its name with a gold medal in the Oatmeal Stout category. It won a silver medal last year and a gold back in 2007 (hence its name). Congrats to James Warren for his first medal as head brewer. For those surprised that no medal came home in the American-Style India Pale Ale category, well, there were 279 entries (nearly double any other category). We still think Project Dank deserved better, but alas, that was a ridiculous number of beers for people to sort through. All told, 234 different breweries won a medal (out of 268 total). That’s some parity across America. More great beer for all of us! Congratulations to all the breweries for representing our state so well. We look forward to heading out and enjoying more of these medal-winning beers in the days ahead! Check you stats, Il Vicino has at least Four Golds. They won best IPA and American Brown back in 96. It says Tenderfoot Brown won silver in ’96, but no IPA winning gold was listed for IV. If you’re sure that’s not right, there’s a place on there where you can send email corrections.